Made in 1989, A Dry White Season, a searing indictment of South Africa under apartheid, was a superb, riveting film that audiences simply did not want to see, despite excellent reviews. Perhaps it was because South Africa was still in the final throes of apartheid and the film was just too uncomfortable to watch. Sometimes people need distance and one suspects that if the film had come out even a decade later it would have probably been more successful. As it is, over the years people have discovered it and been truly affected by its portrayal of racial turmoil in a country divided and the way the film was able to put the politics of apartheid in meaningful human terms. Set in 1976 around the time of the Soweto riots, the film was adapted from a novel by Andre Brink (the only book in Afrikaans to be banned in South Africa), and directed by Euzhan Palcy, who was the first black female director ever hired to direct a major studio film (MGM). Palcy had made the critically acclaimed feature Sugar Cane Alley, which was highly thought of by critics, audiences, and other filmmakers. She co-wrote A Dry White Season with Colin Welland. The film was shot on a fairly tight budget of nine million dollars, an amazing figure when you consider the cast involved – Donald Sutherland (giving the performance of his career), Janet Suzman, Susan Sarandon, and, coming out of retirement because he was so moved by the project, Marlon Brando, who worked for scale. The supporting performances are equally stellar, including Zakes Mokae, Winston Ntshona and Jurgen Prochnow. Marlon Brando is unforgettable as the attorney – he has only two scenes but gives a brilliant performance for which he received an Academy Award nomination for Best Supporting Actor (the film’s only nomination). Thanks to DVD and cable, new audiences have been able to discover this important and terrific film. Its reputation keeps growing with each passing year. 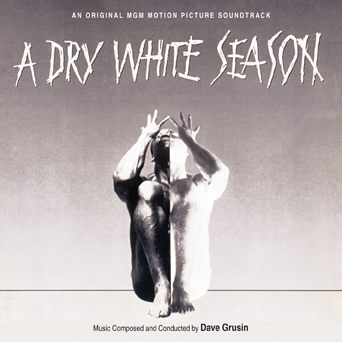 Adding immeasurably to the project is Dave Grusin’s score. Grusin proved to be the perfect choice, and in a career filled with great scores (The Heart Is A Lonely Hunter, Heaven Can Wait, Tootsie, The Goonies, On Golden Pond, The Milagro Beanfield War, Three Days Of The Condor, The Goodbye Girl, Murder By Death, and on and on), A Dry White Season is one of his best – moody, haunting, tension-filled, and extremely moving – like the film, it really gets under your skin. The score as used in the film is quite short. However, some cues went unused, some were truncated, so this CD uses the cues as they were originally written and recorded, which results in a longer playing time and in a more satisfying musical presentation. We’ve included two bonus tracks – alternate versions of two cues and two cues of great Grusin source music. Dave Grusin is one of those composers who can do everything. And he has – from dramatic film scoring to his great work in television (It Takes A Thief, Maude, Good Times, Baretta, The Name Of The Game, Columbo, etc. ), to wonderful light comedy scores, as well as his jazz and arranging/conducting projects for such incredible people as Quincy Jones, Paul Simon, Sergio Mendes, Al Jarreau, Patti Austin, Billy Joel and many others. He is a multiple Grammy Award-winner, a multiple Academy Award nominee (he won the Oscar for The Milagro Beanfield War). Now in his mid-70s, he’s still the coolest guy in any room, and he’s still going strong. This release is limited to 1000 copies only. The price of the CD is $19.98, plus shipping. Additionally, we are offering a special deal with the purchase of this release. Go to the item page and click on the link to find out about it. CD will ship the last week of February – however, preorders placed directly through Kritzerland usually ship one to five weeks earlier (we’ve been averaging four weeks early). This selection is SOLD OUT.